Spare Change, Toxic Relationships – Is it worth the Dime! April 4, 2017 April 4, 2017 by simplisticinsights, posted in SimplisticInsights "Power Blogs"
Are you always the one putting in more than you receive, time and time again? Are you the one that keeps on giving just to get nothing back in return, frowned upon your ways to make another smile. Do you often come off as needy or even obsessive, bit of a try hard? Truth is, we’ve all had those relationships that seem as though we’re the only ones trying to keep it all together, caught with our arms tightly hugged, in hope to keep all the pieces from scattering all along the floor, whist trying not to suffocate ourselves within the process. It always seems that the one who puts in more effort is usually the one that is left broken and disappointed. Many of us take these happenings as a sign of defeat not truly exploring the reasons why, only experiencing an internal disappointment and left concluding we are the issue present. Awkward moments start to become apparent and those uncomfortable instances of silence fill the air of uncertainty and insecurity. We tend to find ourselves trying to fill the void of discomfort with quirky facial expressions and silly sentences, in order to get the slightest sense of validation and acceptance. We give into the fear of inadequacy, seeking assurance from our partners in hope they still feel love toward us and further validate our egos that self-manifest. This could explain why many of us grow so comfortable within our current situations, not questioning our internal happiness, and why we keep investing within those toxic relationships that keep taking us to the core of our discomfort. We all make subconscious decisions to keep people within our lives and continue to put in the effort, even when we are not reciprocated the same amount back. We tend to become delusional towards the fear of loss ever so offer. We as humans invest in things and people all the time, we invest our time, money, energy, emotions and our lives. It’s a big call to give such a treasure so freely don’t you think! After all this is our life and it’s all we have to give right! See the word Investment usually triggers such a strong response in us all, immediately we relate this word to agreement, commitment, sacrifice and effort. Whatever it is we associate it towards one this is for certain, besides the fact that that they are all a way for us to honor our giving word, we know that it is usually expensive and requires a lot of hard work. It genuinely spark a strong response within us all, and I don’t expect any less from it! The more time and emotions we give to certain individuals and situations reinforces the way we feel and even react towards them. We continue to open our hearts, not realizing the message we are conveying within the interim. We mislead ourselves and keep those toxic relationships afloat solely because we feel we have given too much. We continue to spread ourselves thin by openly giving to all, not understanding the underline affect it has on us in the background and when things start to get sour we tend to hold the blame! We continue to sacrifice our internal happiness so often and like a habit we become comfortable with the results, believing it is now expected of us to keep up the fort. Some of us invest in certain individuals so freely without comprehending the consequences that it could bring in time to come. We all know our likes and dislikes, however with this in mind we still tend to invest the pennies of our giving nature and guilt of having someone feel let down, that we tangle ourselves in a suffocating web of regret. 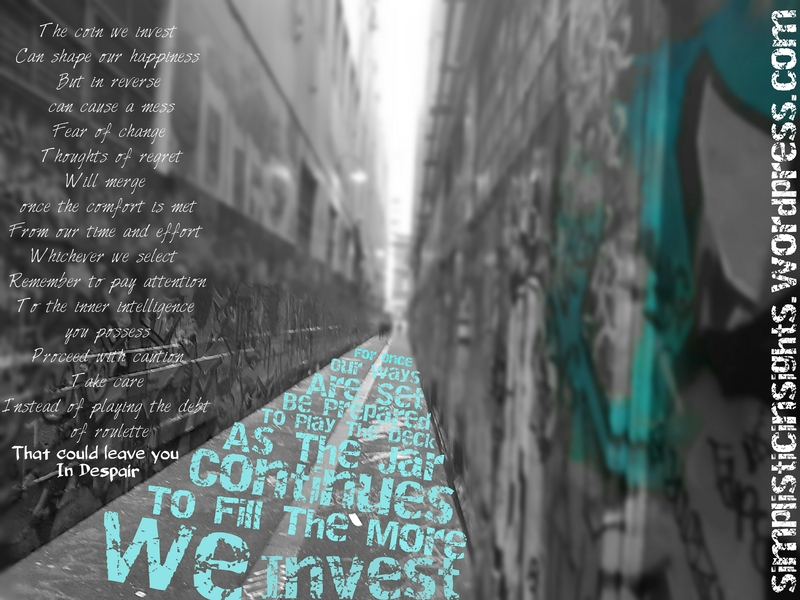 Where we choose to invest ourselves plays such a significance within our lives. When we choose to invest within a certain situation or individuals, we are actually making a subconsciously commitment and accepting to continue to nourish the circumstances at hand. We grow such an emotional attachment to situations and individuals due to the fact that we have subconsciously agreed to commit and continue investing ourselves within this chapter of our lives. We tend to create feeling of guilt and must do attitudes towards the effort and time we have invested within the circumstances, thinking if we let it all go now, it will have all been for nothing. What a waste right! Acknowledge that making an investment, actually reinforces our commitments and overall value towards a specific circumstance or individual. We must be careful of where we choose to focus our energy and not to mislead our internal feelings towards individuals, due to our internal disappointments of guilt or loss of time. See humans build an attachment to things that they have invested themselves within, we become comfortable within certain situations cultivating habits and adjusting our routines to suit, until it becomes second nature and create a so called expectation towards ourselves that we don’t always resonate with. Many times due to our giving nature, we open up so freely towards many individuals and without thought we are the first to give a lending hand. Now this is an amazing and wonderful gesture to give, to support another in time of need is an act from the heavens. However a lot of times we are taken advantage of and our intentions misunderstood, even condemned for our good deeds. We continue to give towards people we feel sympathy towards and those in need without ever questioning our doings. Many times we find ourselves worn out in-between heats of arguments, via others subconsciously building an expectation towards ourselves, our own internal expectations and even fear of being judged. What starts off as a generous lending hand soon becomes an expectation from us and others. We must be conscious of the relationships we initiate, making sure that we still look after ourselves and make sure we are not taken for granted. Others may start to rely on our generosity and even make us feel guilty due to their lack of motivation, ignorance or selfish needs. People tend to build an attitude towards us that has them believe, whatever they do can cause no fault, they give into their selfish needs just because they know they have the upper hand. During many human interactions and relationships there tends to be one that puts in more effort and gives more freely than another. We tend to have this illusion that the one that gives more is on the lower hand and a little insecure. However this is not always the case and not how a partnership ought to be. What should be an effort made from 2 parties or many soon becomes an expectation of one. We are neglected, judged and even made to feel guilty of our giving nature. In the beginning of anything new, we all want to put our best foot forward to impress the external world around us and show our nurturing and understanding nature. However the beginning of each chapter is also where we set our personal boundary’s to show the world how and what we accept and respond to. We must understand is that we mustn’t lose sight of this, as the very beginning of anything new is the point we are actually painting our character and personality’s to all. This could also explain why many couples complain about how their partners may have changed throughout a relationship. It is usually evident during the end of the honeymoon stage as they call it. The honeymoon stage is usually present at the beginning of any relationship when a couple is starting to fall in love, and is always one of excitement, lust and passion. Who can blame us with all those chemicals infusing together to create such a feeling of Europa, it is easy to get side lined. It is a completely new positive and exciting experience. However when the affects wear off and it is all set and done, we are left questioning if this individual is the right one for us. We fall into a reality of always trying to impress the other person to the point we forget that our internal feelings even matter. It is important to set our boundary’s and expectations right from the very beginning, otherwise once the relationship starts to become comfortable and relaxed, the boundaries have already been set and expectations created. In time the more we continue to supplement our internal happiness for others and keep our personal doubts suppressed deep within, we will start to resent our partners and they will be left questioning how this has come to be. Eventually we all fall into character and show our true colors to the world. Don’t ever question your excellence, your happiness and self-worth, you are the most important person in your life, the King/Queen of your kingdom, you choose what reality you are worthy of, not the other way around. I want you to picture yourself as your ultimate idol, set the benchmark of what you except from others, don’t let them take the easy route out and leave you neglected. If others are not as advanced emotionally as you, try guide them and explain your insights and internal feelings, let them understand that you are naturally a caring person but you do expect some reassurance at times. It is worthy to note however, that all reassurance and acceptance can be expressed on all different platforms, from physical touch, to affection, words of affirmation, quality time and gift giving. (I highly recommend reading “The Five Love Languages” from Gary Chapman if you wish to indulge within this amazing insight, I promise it won’t disappoint). Put your partner on the line and have them explain to you every now and then how they are feeling about the relationship, open communication can do wonders to eliminate uncertainties. It is of higher importance to accept your partner for who they are, let them give from their own heart in their own way and appreciate them for it. Don’t be disappointed and try supplement their response to fill a void that is not in alignment with your own. See it for what it is and understand the intention it has been given in. Truth is when we fall into this bottomless pit of negativity, we become addicted to the slightest bit of acceptance that we don’t give the other space to appreciate us, to miss us, have them think of us and realise that the stakes are high, and that there is a possibility that they may lose something amazing. In time they will feel pressured with our expectations, question their level of commitment and love towards us, feeling guilt towards the fact that we may have invested too much, too soon and left ourselves vulnerable, and open to disappointment if the relationship was not to work out. They feel as though if they were to cut their losses sooner rather than later, we may not be left as hurt and shattered opposed to the longer they keep it up. They eventually distance themselves away, not letting the relationship flow naturally and blossom the way that it was intended to. They sacrifice what could be, due to the fact that they feel responsible for our happiness, and that’s a huge commitment to hold afloat, don’t you agree! There are many ways we can seek acceptance discreetly, without coming off as needy and insecure, one way is to acknowledge your partners body language and energy when you are around them, do they open up and share, do they talk highly of you to others, these things all add assurance of their commitment within the relationship. But deep down and most importantly how do they make you feel about the relationship? Are you positive around them because they make you happy, or do you feel guilty due to the continuous investment you have surrendered within the relationship, that you fear to lose all your hard efforts? This will cause you to search deep within your emotions, however be aware that if you are in a low state when doing so, that you will interoperate all external data in a bias and negative state, flush it all away and see them for who they are. See them as a family member that you love unconditionally, and acceptance them for who they are. See how you complement each other, weigh up the pros and cons, talk openly, and understand that no one is perfect, but how perfect are they for you! Sure we can compensate and put more effort towards the relationship in certain circumstances if we are happy to do so, and if the relationship is in agreeance with it until it grows. However understand that a partnership is a method of people working together, and we should give as much as we get. If you feel that you need more, understand that these internal feelings should be shared and communicated, ask yourself, ”do I feel worthy of the other person, do I feel that I am deserving of this happiness in my life, am I worth it? Or should I say, are they worth YOU! That we must be alert and always understand each situation with a clear conscious towards what we are choosing to invest in. Rid the fear of disappointment and uncertainty’s to give your word to something that you are willing to back till the end. Understand that if you have expectations you would like met and that are in alignment with what you appreciate and deserve, let your partner know this, that way they know where you stand. Be comfortable with your partner and ask them how they understand themselves, which can help you decipher their intentions and gestures. Don’t ever think that you are the problem or feel as though you are nagging them in doing so, you just understand yourself on a deeper level opposed to your partner. As for any good relationship to continue blossoming, know that communication and acceptance is required. So remember to question your current relationships and future ones. Make sure you put your best foot forward but also set your boundary’s. Express yourself to others and have them understand your expectations from the get go. Appreciate others for who they are with unconditional love, we all invest within relationships in different ways. Understand each other, speak openly and choose to commit to the circumstances you are both in agreeance with. Rid the fear of loss and understand it’s natural to feel attached to situations and individuals due to the continuous investment you have committed towards, be yourself and make your intentions clear. Our life is our world, and the paths we choose to tread will be the experience we receive. It’s up to you, it always has been! I hope you enjoyed my post, and look forward to everyone’s insights and comments to come.